Spray 6 muffin cups with cooking spray. 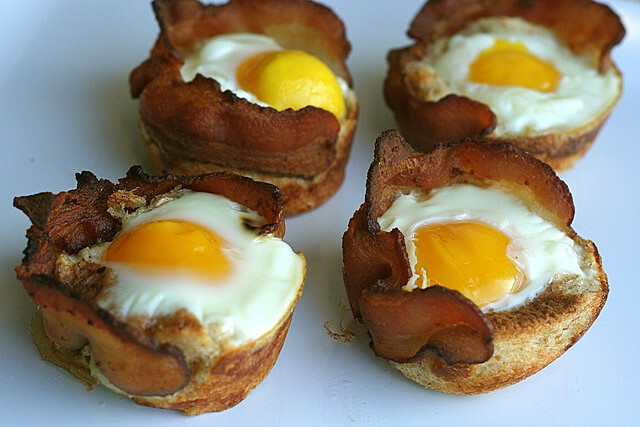 Line each of the muffin cups with a slice of bacon going around the sides, not covering the bottom. Fill each cup with one egg. You’re also welcome to join my facebook Support page. Just click here to find it! 2. It keeps you from being hungry FOR HOURS!! 5. Can you get too much fat? Maybe! The extra fat when beginning Keto helps you get into fat burning mode. Once you’re fat adapted, you may have to tweak this amount. Butter – read the label – it must be real butter – the only ingredients should be cream and salt. Never use margarine! 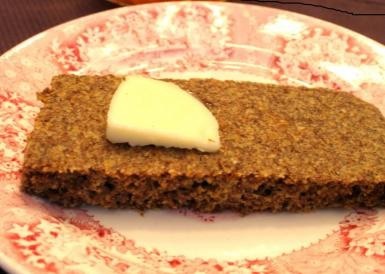 I like a nice grass-fed butter like Kerry-Gold, but any REAL butter is fine. The Coconut oil promotes high energy, fat loss, and brain function. It will make you feel better and get thinner. It also makes the coffee have a better feel in your mouth, but coffee with just butter, or butter and heavy whipping cream, is ok too. Some people like to blend their BPC. – it creates a froth on top and tastes more like a latte. I use a Milk Frother to whip up a nice froth. 🙂 I have a BPC with breakfast each day and don’t get hungry until about 3pm!! I started with 1/4 tsp of coconut oil and 1/4 tsp of butter and a couple of shakes of cinnamon in my mug, add about a Tbs of coffee and stir til oils are melted. Then I add a splash of HWC (heavy whipping cream) and froth it up! mmmm good to go! IMPORTANT- start off with about 1/4 tsp of coconut oil and 1/4 tsp of butter and work up to higher levels to avoid tummy upset . 🙂 Some people use up to a Tablespoon or more of oils once their body is adapted. Some people like to blend their BPC, but hot liquid in a blender may be tricky! !Here’s a recipe for blended BPC – do be careful with hot liquid in a blender – read your blender’s instructions for blending hot items! #1 Brew coffee as you normally would. #3 Empty hot water from the now pre-heated blender and add the brewed coffee (2 cups), butter, and MCT oil. Blend (STOP AND VENT blender every 10 seconds to let the steam out) until there is a thick layer of foam on top like a latte. A Blend-tec or Vitamix blender will do it quickly, a normal countertop blender takes longer, and a handblender works ok if you don’t have a real blender. A Milk frother works GREAT! BUT if you’d rather blend and need a blender, here’s the one I use: the Ninja Master Pro. (sounds fancy, huh? lol) It’s really great and I love it because it’s so much easier to clean! The motor sits on top – you don’t have to screw it together with the blades, just lift it off and the blade assemble just lifts out as well. #5 : Put on a satisfied look and enjoy the high performance buzz from your creamy mug of Bulletproof Coffee as you watch your chubby, tired co-workers eat low-fat yogurt and twigs for breakfast. It’s almost unfair. If you’re diabetic and want to learn LCHF/A Ketogenic Lifestyle, Click here to check out my Keto Support Group on facebook! You can also join Keto School for a self paced series of lessons on how to do Keto by clicking here. Vegans may find it very difficult. Strain and eat!Don’t have a crockpot? This is the one I use and love – the Hamilton Beach Simplicity. I like the size and the shape of the pot allows for large items to fit well. If you want to learn how to follow an LCHF/Ketogenic Lifestyle, Check out KetoSchool, a self-guided series of lessons. I started this recipe with 4 frozen chicken breasts. I just put them in a baggie filled with cool salted water long enough to be able to pull the breasts apart and place in crockpot. If you’re using thawed breasts, set crockkpot on low, not high. If you’re going to cook breasts while gone to work, set on low, not high. Add broth to crockpot with chicken. Set crockpot oh HIGH for a couple of hours, check to see if meat is cooked through. If not, let cook a little longer. 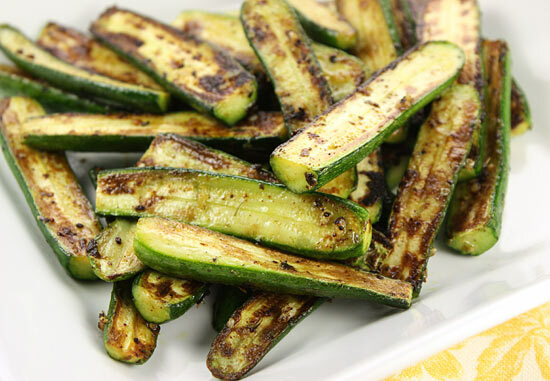 When meat is cooked, take out and shred, then place back in crockpot while preparing zucchini and turn to LOW. 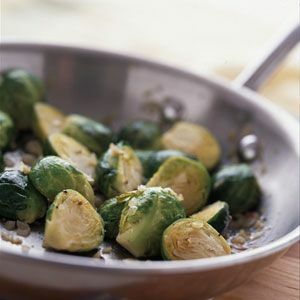 Prepare zuchs and place in a baking pan and brush generously with olive oil. Cover the pan with foil and bake at 350 degrees F for 30 minutes. 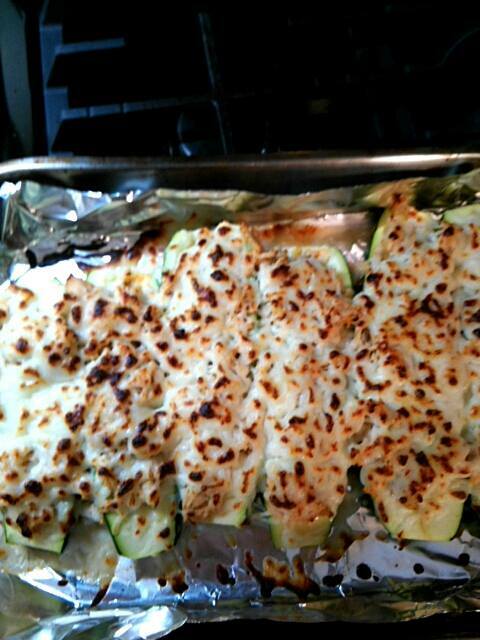 Remove foil, cover boats with mozz cheese and place under broiler for 3 minutes until cheese just begins to brown. I quadruple the amounts and Mix in an airtight jar to keep on hand. Use 4 tbs. of seasoning for each pound of meat used. If you’re diabetic and want to learn LCHF/A Ketogenic Lifestyle, Check out KetoKitty! She’ll take you, step by step, through everything you need to know to learn how to KETO! Start the ground round cooking in a heavy skillet over high heat; spread it out to cover the bottom of the pan so it cooks quicker. While the ground beef is browning, chop the onion and crush the garlic. Plunk them in the pan with the ground beef, and stir it up, using a spatula to turn it over and break it up so that it cooks evenly. Cover the pan and let it continue cooking. Meanwhile, chop the cabbage coarsely. Stir this into the beef mixture a bit at a time, it may come close to overwhelming your skillet. Take care to turn everything over to keep it cooking evenly. Re-cover the pan. Continue to stir the meat mixture to keep it cooking evenly, covering in between stirrings. 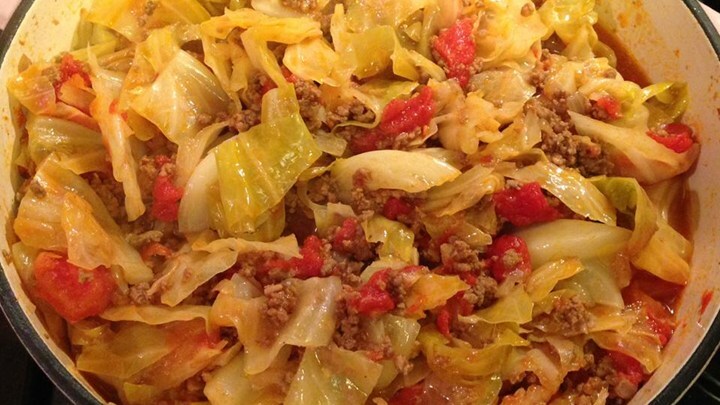 When the cabbage is starting to wilt, stir in the tomato sauce, lemon juice, pepper, nutmeg, cinnamon and salt. Re-cover, let the whole thing simmer for 5 minutes, then serve. If you’re diabetic and want to learn LCHF/A Ketogenic Lifestyle, Click here to check out KetoKitty! She’ll take you, step by step, through everything you need to know to learn how to KETO! Sprinkle both sides of Pork Chops with Pepper, rubbing it lightly into the pork. In a 10 inch skillet, cook Pork in hot oil for 8 – 10 minutes, or until juices run clear and an instant-read thermometer inserted in center of chop registers 155 degrees F. turning half way through cooking. Remove Pork and keep warm. For sauce, carefully add the water to the hot skillet. Add broth to skillet and heat until bubbly. Using a wire whisk, heat and whisk over medium heat until the cream cheese is melted. Transfer warm Pork to 4 dinner plates. 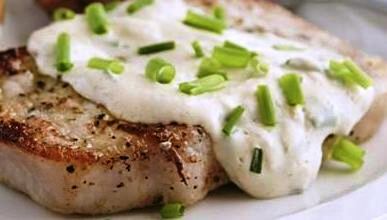 Spoon Sauce atop pork and, if desired, sprinkle with chives. Heat pan over med-high heat. Add Mustard seed, Cumin seed, and Fennel seed – cook and stir for 30 seconds. Stir in Nuts and Vinegar. Calories: 51; Total Fat: 3grams: Sat Fat: 0, Sodium 225 mg; Carbs: 6 grams, Fiber 2 grams, Protein: 2 grams. If you’re diabetic and want to learn LCHF/A Ketogenic Lifestyle, Click here to check out my KetoStyle Blog. It will take you, step by step, through everything you need to know to learn how to KETO! Add Walnuts, Oregano, Salt and Pepper. Cook and stir for 1 minute more. Prepare pan (a 10X15 pan with sides works best) with oiled parchment paper or a silicone mat. 2) Add the water and oil to the dry and mix well. Make a well in the center and add the eggs – mix the eggs together well, then incorporate with the dry mix. 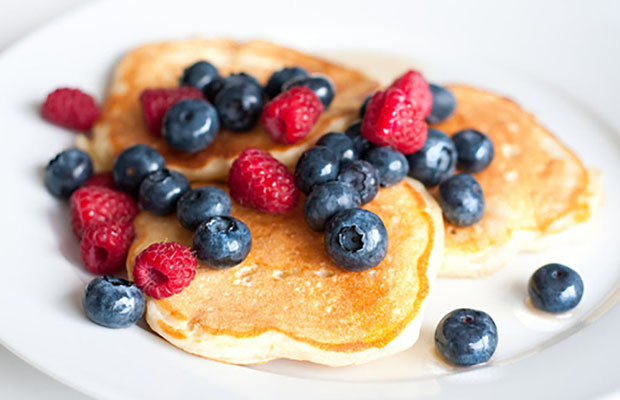 Make sure there aren’t obvious strings of egg white hanging out in the batter. 4) Pour batter onto pan. Because it’s going to tend to mound in the middle, you’ll get a more even thickness if you spread it away from the center somewhat, in roughly a rectangle an inch or two from the sides of the pan. 5) Bake for about 24-28 minutes, until it springs back when you touch the top and/or is visibly browning. 6) Remove from oven and sprinkle powdered Swerve evenly over the top. 7) Let cool and slice into squares – any size you prefer – I cut into brownie size squares. 8) Sprinkle again with a little more powdered Swerve. 1. Preheat a pan for cooking. Spray well with non-stick spray just before pouring in the batter or use butter/oil. 2. Combine the coconut milk, eggs, oil and vanilla in a small bowl. Mix thoroughly with a fork for about 1 minute. 3. Add the flax meal, almond flour, protein powder, baking powder, granular sugar substitute, nutmeg and salt. Mix thoroughly. 4. Pour 1/4 cup at a time into the hot pan. 5. Cook for 3-5 minutes until golden brown and set and flip. Cook for another few minutes.